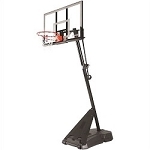 Most basketball hoop purchases provide an excellent upgrade to your home, or at least provide a long lasting product that can provide many years of use. Thus, most basketball hoop manufacturers provide product warranties for their items. They understand that you are wanting the system to last a long time while your family grows up. However, just about every manufacturers' warranty is different, sometimes even from the same manufacturer. We will discuss these here. Please note that this information is accurate the day that this post is published. Details may have changed since this posting. Lifetime Products has two different warranty periods, depending on the system you purchase. Their low-end basketball goals are warrantied for 5 years; their high-end goals - the Mammoth basketball line - are warrantied for the lifetime of the system. You should note the warranty details as each manufacturer outlines what is warrantied and what is not, what use is warrantied and what is not, and what constitutes a warranty claim and what does not. For instance, on Lifetime's high-end basketball hoop warranty, the rim is warrantied against manufacturing defects in materials and workmanship for the lifetime of the hoop. However, if the rim is damaged due to dunking, the warranty is void. These warranties are only good for residential use. Specific questions about warranty details should be directed to Lifetime Products at 1-800-225-3865. Like Lifetime Products, Spalding has two different warranties. Their warranties deal with the backboard material. The generic warranty deals with all hardware and framing parts of the system, which is 1 year. The warranty is then different for acrylic / polycarbonate and glass backboards. For polycarbonate and acrylic backboards on their low-end systems, the warranty is 5 years long. On acrylic backboards on their high-end systems - the Arena View basketball line - the warranty is 8 years. The warranty on their glass backboards, which is entirely unique to Spalding - is a limited lifetime warranty. Much like the Mammoth basketball line from Lifetime Products, one thing that is excluded from Spalding's warranty is damage due to dunking. These warranties are only good for residential use. Additional and specific warranty questions should be directed to Spalding at 1-800-558-5234. Goalrilla is essentially the same as Mammoth when it comes to their warranties. Their goals are warrantied with a limited lifetime warranty. The warranty, again, protects against manufacturing defects in workmanship and materials. The warranty is also void if used abusively, i.e. for uses other than basketball, or for activity specific uses, such as hanging on the rim. Goalrilla also has a low-end basketball line, called Silverback. The Silverback systems have the same general coverage as their big brother Goalrilla counterparts for a 7 year period. These warranties are only good for residential use. Specific warranty questions should be directed to Escalade Sports at 1-800-467-1421. Goalsetter is by far the most unique in their warranty coverage. All of their goals in-ground goals come with a limited lifetime warranty like Goalrilla and Mammoth, but they cover activities that these other two manufacturers do not, e.g. dunking. Note that Goalsetter does not warranty against hanging, just dunking. 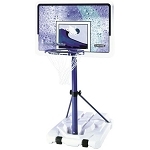 Goalsetter also is interesting in that they offer their warranties for nonresidential use (commercial use such as schools and city parks) when the basketball hoop is ordered with an acrylic backboard material. No other major manufacturer does this. Specific warranty coverage questions should be directed to Goalsetter at 1-800-362-4625. It is important to have a decent warranty as it is sometime possible that the manufacturer has made a mistake creating problem. If you find this is true with your hoop give the manufacturer a call and they will be happy to help.